A valid question considering the numerous LCD monitor and keyboard copycat manufacturers flooding the market. Following is our “Top 25 List” of what makes General Digital stand apart from the imitators. By the way, we would like to mention how grateful we are for our loyal customers’ referrals of friends and associates to General Digital. 1. 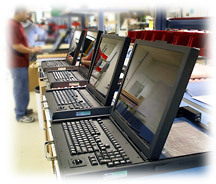 U.S.A. designed, manufactured and serviced flat panel products since 1977. 2. Highly trained and tenured production staff delivers to our valued customers quality and reliability in every product. 3. All overlay procedures (touch screens, vandal shields, optical filters, bonding) performed in Class 100 laminar flow bench (clean bench) to minimize contamination on display surface. 4. Being a small business makes us agile enough to accommodate special requests. We differentiate ourselves from other small businesses that are often unable to fulfill special requests because of resource limitations and lack of expertise; whereas large businesses are often unwilling to fulfill special requests due to overhead and feasibility restrictions. 5. General Digital is registered with the United States government’s Central Contractor’s Registration (CCR), the Small Business Administration (SBA), and the Directorate of Defense Trade Controls (DDTC) pursuant to the Arms Export Control Act (AECA) and the International Traffic in Arms Regulations (ITAR Part 122). 6. We’ve brought to the market numerous technological innovations since our inception in 1973. 7. Flexible, modular designs provide internal building blocks that can be used on multiple product platforms, or that can be incorporated into custom products to reduce development time; it also facilitates the replacement of obsolete components with like or equivalent substitutes to support long product life cycles. 8. Integration of Pro Engineer™ Development Suite with General Digital’s revolutionary Blue Books™ for maintaining the hundreds of custom configurations of our flat panel products and associated peripherals. 9. Majority of our products are packaged in rugged, all-metal enclosures. 10. Small business mentality and infrastructure unencumbers engineering team such that they can quickly respond to custom requirements and design challenges. 11. Engineering prowess second to none. From Electrical and Mechanical Engineering to Software and Compliance Engineering, our talented workforce possesses the willingness and expertise to design systems and applications tailored to meet your specific requirements. 12. We have a vast standard product offering. 13. We offer a multitude of standard and custom options to suit ruggedized, specialized and customized applications. 14. Integration of flat panel displays from multiple sources of supply allows us to offer our customers the best price vs. performance advantages. 15. Video controllers provide vastly enhanced features not found in commodity LCD monitors, such as gamma control, remote power on/off, picture-in-picture, tiling of multiple video sources, run time counters, and more. 16. We possess in-house equipment for design, test and validation including temperature/humidity chamber, photometers, colorimeters, IR thermometer and thermocouples, and data logger. 17. Product burn-in at minimum room temperature for 72 hours; up to 168 hours for demanding applications. 18. On-site inspectors trained to IPC-A-610, Rev. C standards. 19. Quality control inspection is performed on 100% of product manufactured, not on a sample lot. 20. All displays inspected to MIL-PRF-13830 80/50 scratch/dig criteria. 21. Attention and dedication to configuration control; the majority of our customers are government or Department of Defense related, many of whom require “frozen” parts lists or Engineering Change Notice approvals before acceptance of product modifications. 22. 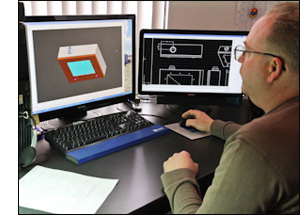 We manufacture both standard and custom products as long as the components are commercially available. 23. Upon our notification of component obsolescence, we offer all our affected customers last-time-buy opportunities. 24. We support our products long after component obsolescence with like or equivalent replacement components.